Ed Walker: "We just need to find that one proper horse"
Cash is king and Ed Walker intends on making 2019 pay after enjoying his finest campaign last year. Walker spent Saturday morning entertaining owners and guests at his Kingsdown base in Lambourn where he outlined his targets, dreams and ideas for the season, which included a first Group 1 triumph. The yard, full with 80 horses, enjoyed 61 British winners last term, which helped bring in £820,242 in prize-money – more than double his previous best – although that does not include the £250,000 stable stalwarts Stormy Antarctic and Indian Blessing pocketed on their overseas expeditions. "It was our best season so we can't begrudge that," said Walker, who will again employ Liam Keniry, Gerald Mosse and the best available jockeys. "As long as we keep going in the right direction, I'll be happy. "We just need to find that one proper horse." The trainer, who moved to Lambourn at the end of 2016, added: "I'm probably less concerned about winning a vast number of races and more concerned about being competitive at a higher level. "Winning, obviously, is everything, but I think we've got some really nice horses and wouldn't be surprised this year if we're down on winners but up on money – that's my prediction. "That's because a lot of our nice three-year-olds are going to be pitched in at the deep end as I believe they're good horses, but those good races are harder to win. "I'm desperate to get the Group 1 monkey off our back and to win one would be everything." Two likely headline-makers for Walker include last year's Sandringham winner Agrotera and the capable Fille De Reve. He continued: "Agrotera heads to Kempton next Saturday for the Listed Snowdrop Stakes. She's training well and is a very talented mare, although she's not the easiest to train. "She never quite hit the heights of Royal Ascot in the second half of last season, but we're working back from the Duke of Cambridge with her. We'd love to go back to Ascot for a course-and-distance Group 2. "As for Fille De Reve, she was progressive last season, winning twice, and I think the Wokingham is tailor-made for her; a flat-out, fast-ground, six-furlong sprint. We'll try to win a race between now and Ascot to get a high enough mark to get in. That's the plan and it'd be great to squeeze her in at the bottom of the weights." Stormy Antarctic, whose big target may be the Grosser Dallmayr Preis - Bayerisches Zuchtrennen he was second in last year, gets the Pattern-race ball rolling in Sunday's Kalkmann Fruhjahrs-Meile at Dusseldorf and could be aimed at the Al Shaqab Lockinge if conditions at Newbury are testing, while Indian Blessing starts in Lingfield's Betfred Supports Jack Berry House Chartwell Fillies' Stakes on May 11 before an international programme. The Commonwealth Cup is the dream for "exciting" Listed winner Royal Intervention and Sunday Star, who "is working really well and looks great", heads for the Lanwades Stud Nell Gwyn Stakes at Newmarket on Tuesday. Baba Ghanouj is another three-year-old filly who has pleased over the winter and Cap Francais, Ginistrelli, Duckett's Grove and Glorious Lover are well thought of males. The next batch of potential stars are also a nice bunch according to the ex-Newmarket operator. "I'm very happy with the two-year-olds," Walker said. "I've not got many early ones – probably only two or three who could be potential Royal Ascot horses – but the rest are more second-half-of-the-season types, well bred and scopey." Ed Walker on some of the names we could be hearing plenty about in the next few months. She's Agrotera's little sister by Sea The Stars and won a novice impressively at Wolverhampton. She's done nicely over the winter. He went to Kempton on Thursday morning for an away day and is going to start in Epsom's Derby trial. He's had a good winter and did well last season. He hasn't got a Derby entry, but if he wins that trial he'll get a free entry. He won a hot maiden in Ireland for Emmet Mullins and Mr Siu bought him through Alastair Donald. We gave him one piece of work and then ran him and he was disappointing, but he's done exceptionally well through the winter. He's really filled out and grown and is a big horse. He's got an entry in the Feilden Stakes at Newmarket on Tuesday, but I'm not sure we'll take that up as it looks a warm race. We'll have a look, but he's a smart horse I think will stay well. We're slightly trying to get back on track with him, so we might take it a bit more gradually. He's a promising horse who didn't do much wrong at two. He did it the hard way from the front at Newmarket and his stamina saw him over the line. He's going to stay well this year and we'll start him at Windsor on Monday and then hopefully look forward to a fruitful campaign. He's is a nice three-year-old and was second in what was the Winkworth last year. He then had a bit of a setback, but is training well and could have a good season. She's most likely to win a Group 1 – if she's going to – in America later in the year, but hopefully we can have some fun with her beforehand and she's going to Lingfield for the Listed Chartwell Stakes on May 11. She's very exciting. 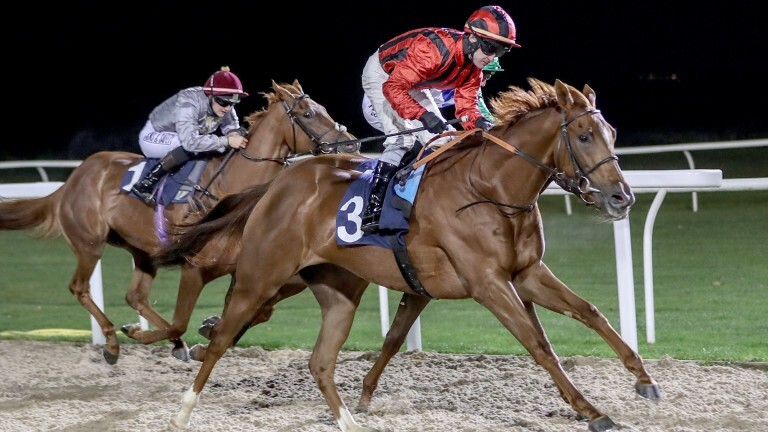 It's quite a hard programme for three-year-old sprinting fillies and we're going to aim her at the Listed Chelmer Fillies' Stakes at Chelmsford on May 2. I think she is a sprinter and we never really considered stepping her up to seven and going for a Guineas campaign. I'd love her to win at Chelmsford and then we can head to Royal Ascot for the Commonwealth Cup; that's the dream. He runs in Germany on Sunday and can hopefully start off his campaign on the right foot. He's in really good order – as good as ever. He had a great time last year, so hopefully can do so again. He'll be in most of the big European Group 1s and probably won't run unless it's soft ground or they look very open. It's hard to know about the miling division this year with some names missing, but there will always be others coming through the ranks. He's in the Lockinge and if Germany goes well and Newbury is soft I'd love to have a crack at that. We're desperate to win a Group 1 with him and that's most likely to happen abroad, so we'd love to go one better in the German race he was second in last year. We can keep running in the big Group 1s and finishing fourth or we can bat a bit cleverer, so we'll keep options open. She's working really well. I've been very happy with her and everything has gone smoothly through the winter. It's always been the plan to start her in the Nell Gwyn on Tuesday and she handles Newmarket very well, winning a maiden on the Rowley Mile before finishing third in the Oh So Sharp. Her form is solid and she hasn't missed a beat. She looks great and I'm very excited about her.